What Presentation Manager | Your Options To Replace PowerPoint? How much thought have you given to your choice of PowerPoint as your choice of presentation manager? The chances are that if you are a pc user you really haven’t explored any other alternatives to the PowerPoint solution. And that’s why we’ve all become used to working with and watching PowerPoint slide decks. But if you are thinking of upgrading your system, perhaps beyond Office 2010, you might want to know that there are alternatives to PowerPoint as your choice of presentation manager…but they all have their advantages and disadvantages. The team at PC World has done some research into all the various web-based PowerPoint alternatives. They’ve come up with five choices for your presentation manager. Prezi.com. This simulates a giant whiteboard and allows you, the presenter, to zoom around, point by point. It’s a creative alternative, though it’s not cheap. SlideRocket.com. A fully featured and robust piece of web-based software. This appears to tick all the user needs. If anything, there might be too many user options. 280 Slides. This looks and feels rudimentary. It’s as if there’s still work to do. It’s not yet a serious contender as a presentation manager. Google Docs Presentations. This looks and feels like a restricted use product and is probably best used when travelling and there’s nothing else available. Zoho Show. With fewer attractive features than the incumbent, PowerPoint, this presentation manager is not as good as SlideRocket, but scores points over Google Docs Presentations. So what’s the best presentation manager? Well, PowerPoint in the Office 2016 package is still very good. You might be tempted by Zoho.com if you wanted to use the complete Zoho.com suite as an alternative to office. And don’t overlook SlideRocket, which is a serious alternative presentation manager to PowerPoint. A PresentPerfectTM presentation skills training course will give you more insight into your use of a suitable presentation manager when you present. 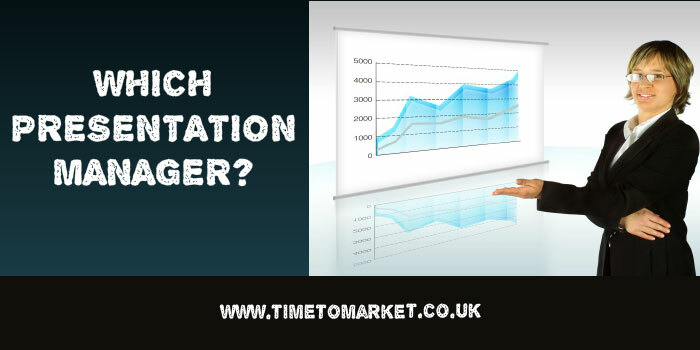 You can call 01344 859823 or email: training@timetomarket.co.uk.